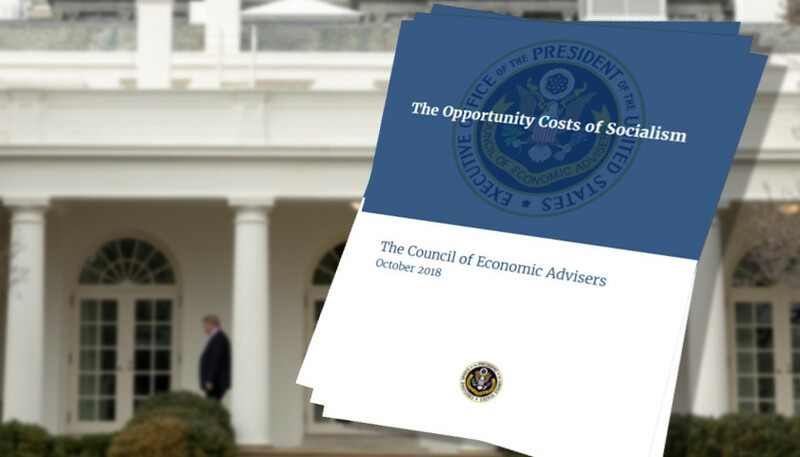 “Coincident with the 200th anniversary of Karl Marx’s birth, socialism is making a comeback in American political discourse.” This is the opening sentence of an October 23, 2018 72-page paper produced by the “Council of Economic Advisors,” over forty professional economists working for Trump White House. The Cold War-style paper was released at the height of campaigning for the midterm elections, and it was intended to scare people into thinking that high-profile Democrats are intent on bringing about economic collapse through adopting “socialist” policies. Along with Trump’s own invective at rallies and in tweets, the goal was to link the Democratic leadership to the progressive opposition in the party and then to link self described democratic socialists like like Alexandria Ocasio-Cortez to the Russian Revolution, Stalinism, and Venezuela! Instead, Ocasio-Cortez and Rashida Tlaib of the DSA were elected to Congress and other democratic socialists were elected at state level in a record turnout election in a rebuke of Trump’s right-wing scaremongering. But while the immediate motivation of the report was political messaging in the midterms, the Council of Economic Advisors and the right-wing administration that hired them are terribly worried about the growing popularity of socialist ideas in the U.S. In all the ink spilled by professional ideologues in this White House paper, they fail to address the central question: Why are so many people, particularly young people, so interested in socialist ideas right now? They don’t attempt to answer this because any honest response would be a damning indictment of today’s capitalism “on steroids.” This upcoming generation faces record levels of economic inequality, disastrous climate change, a future of perpetual debt, and low-wage jobs with continued structural racism and sexism. Marx’s ideas of class struggle remain incredibly relevant today, 200 years after his birth. Many news sources have commented on this White House paper, but they’ve all failed to address the underlying roots of the growing importance of socialist ideas or give a coherent definition of socialism. Instead, outlets from the New York Times to CNN and Vox.com focus on mocking the absurdity of a document that lumps Democrat Elizabeth Warren in with dictator Joseph Stalin. Not that there aren’t a lot of things in this paper worthy of ridicule, including whole pages and a graph about the cost of a pick-up truck in countries around the world. Still, the mainstream and liberal commentary on this White House document lack serious analysis and answers to the questions being discussed. Many of the economists who wrote this document are former “free trade fundamentalists” who argued against all government intervention in the world economy, but they are now defending Trump’s approach of increased tariffs and protectionist measures pointing toward a deepening trade war, particularly with China. In their defense of a system in crisis, they switch one ideological justification for another at alarming speed to defend capitalism and justify exploitation of working people. This “flip-flop” reflects their increasing uneasiness about a so-called “economic recovery” based on skyrocketing inequality and debt that is at risk of tipping into yet another worldwide recession. The U.S. stock market has experienced significant losses in recent weeks, spooked by rising interest rates and the growing fear of a recession or a more serious global financial crisis. The ruling class knows this recovery has only benefited the richest 1% while ballooning debt expands across the planet. Serious pro-capitalist publications are expressing extreme anxiety about the potential for a renewed economic crisis. The 72-page screed from the White House doesn’t openly acknowledge the tenuous economic position, but they are clearly worried that interest in socialist ideas will continue to grow in the coming years due to capitalism’s inability to deliver stable living standards. The billionaires and their talking heads should be concerned. Along with a growing but still small socialist movement in the U.S., working people are beginning to fight back with explosive struggles. The teachers revolt showed that even “red states” dominated by Republican lawmakers can be rocked by the most determined and successful strikes. Unorganized workers, like those at Google and McDonald’s, two of the world’s most important corporations,have taken workplace action against sexual harassment. In the past, socialist organizations in the U.S. have grown alongside increasing class struggle. The White House paper correctly points out that “it is unclear, of course, exactly what a typical voter has in mind when he or she thinks of ‘socialism.’” This is also true of Sanders’ supporters and most of the 50,000 members of the Democratic Socialists of America (DSA). Socialist Alternative has engaged in the debate about the character of genuine socialism and have found an openness to our ideas for a full break with capitalism and the importance of the working class being central to victorious movements. The interest in changing society is connected to a decreasing faith in traditional politicians, reflected on both the “left” and “right.” If socialists are unable to win over big sections of the working class, then the space for right-wing ideas can grow, especially with a renewed economic downturn. In the absence of a clear alternative, a section of ordinary people can be convinced to look for scapegoats to blame their problems on – correctly pointing their fingers at corporate Democratic Party politicians but also being drawn toward racist, xenophobic, or sexist ideas. Bold movements with a clear appeal to working people can cut across this. For instance, a majority of Republican voters support “Medicare for All” guaranteed health care. In the recent midterm, traditionally “red” states Idaho, Utah, and Nebraska passed measures to expand Medicaid; in August, Missouri voters struck down the state’s anti-labor “right to work” law. The White House paper on socialism opened itself up to mockery on health care. While attacking government-provided health care in other countries, the document holds up Medicare (a government program) as a counter-example! The mainstream responses stop at ridiculing this argument instead of genuinely analyzing why the U.S. doesn’t have a comprehensive single-payer health care system despite the popularity of this policy. The corporate media also fails to explain why there are long wait lines and other complications in the government-funded medical systems in Europe and elsewhere. Guaranteed health care was won in Britain after World War II alongside many other “welfare state” reforms throughout Europe. These victories were not handed over by the pro-capitalist politicians, but rather fought for with protests, strikes and political action. Mass working-class labor, socialist, and communist parties gained support championing health care for all, and the labor movement increased its influence in the post-war period. In the U.S. during the ‘30s and ‘40s, workers won Social Security, the GI Bill, and health and pension benefits in many corporations as a result of massive strike waves and the building of major industrial unions. However, if we’d had a mass workers party, then far more could have been achieved. In reality, both major political parties are controlled by Wall Street despite their differences with each other. The multi billion dollar sickness industry of pharmaceutical companies, insurance companies and hospital chains buy off politicians from both parties, making “single-payer” health care an extremely popular idea that neither party’s leadership has promoted. In the midst of new struggles and tens of thousands joining socialist organizations, this situation can change. Socialist Alternative supports and fights for any gains that can be won under capitalism that improve the lives of working people such as increased wages and taxes on the super-wealthy to improve social services like health care and education. At the same time, we know that anything the capitalists give us with one hand due to struggle, they will take away with the other hand when our movements die down or their system goes into crisis. For instance, government-funded health care is being underfunded and attacked in Britain and throughout Europe, leading to layoffs and decreased quality of services. Despite the claims of Bernie Sanders, this White House paper, and much of the mainstream media, Sweden is not a socialist country; despite important reforms won by the workers movement in the past, the power of the top corporations over politics and society was never broken there. In reality, Sweden has experienced draconian budget cuts as their politicians make workers pay for the worldwide economic crisis. This is why we call for breaking the power of the pharmaceutical companies and all the top 500 predatory corporations that rule our politics, workplaces and lives. Health care should be a human right, and so should housing, food, education, and transportation. Public ownership of the energy industry could help provide green jobs and transition away from fossil fuels to renewable energy. Democratic workers’ control and management of the big banks could end predatory lending and the “casino capitalism” that gambles on our lives and begs for billions in taxpayers bailouts when they fail. Capitalism isn’t meetings the basic needs of millions in the U.S. and across the world. According to a new study by the United Way ALICE Project, about 43% of U.S. households don’t earn enough to afford a monthly budget that includes housing, food, child care, health care, transportation, and a cell phone. The only way to guarantee a decent standard of living for all is by taking the top corporations into democratic workers control and management to share out the resources and meet the needs of society. Both the White House document and the mainstream media response retail many of the falsehoods, albeit from different standpoints. They both give a warped view of what’s taken place in Venezuela over the last 20 years. They both group the Russian revolutionary V.I. Lenin in with the Stalinists and bureaucrats who carried out a counter-revolution against the liberatory transformation that Lenin helped lead in 1917. Venezuela is cited over and over again in the White House paper as an example of the failure of “socialism.” However, the rule of capitalism was never broken in Venezuela despite big movements and some positive reforms. For instance, while the oil wealth in Venezuela was used to fund literacy and health care programs, most of it was used to pay off international big banks. When oil prices dropped, crisis ensued. The failure of Presidents Chavez and Maduro to mobilize working people to end exploitation in Venezuela left room for the billionaires internationally, particularly in the U.S., to help sabotage the economy and fund a right-wing opposition led by outright oligarchs. Taking control of the oil companies to help fund social services which is what was really needed would have been too much for the international capitalists to stomach. The failure of populist reformism in Venezuela shows that a movement from below and a mobilized working class is necessary to defeat right-wing reaction and international capitalist sabotage. The Russian Revolutions of 1917 overthrew a feudal monarchy, helped end World War I, and brought society under the control of democratic councils of workers, peasants, and soldiers. Lenin and the Bolshevik Party played the leading role in bringing this revolution to victory which became a beacon of hope internationally. Faced with invasions by numerous capitalist armies, a largely rural country and the lack of successful revolts elsewhere, the Russian Revolution became isolated, leaving space for Stalin’s bureaucracy to establish a dictatorship that rested on the gains of the planned economy. This is worth study by socialists, and Lenin should not be lumped in with the Stalinists who attempt to hijack his ideas. Socialist Alternative has debated with Jacobin editor Bhaskar Sunkara the lessons of this experience for today’s socialists. Both Venezuela and Russia lacked the vast advanced industrial and technological wealth of the U.S., and the White House paper implies that socialism in the U.S. would mean a return to an agricultural society. Socialists argue for using the greatest technological advances developed under capitalism and unleashing the unused intellectual power of workers confined to lives of drudgery to further develop technology. Today, innovation is used to threaten layoffs and drive down wages when instead technology could shorten the working week and share out the work with no loss in pay. This 72-page White House diatribe paper brings out the old, tired arguments that socialism is against human nature and many other slanders that can’t fully be addressed here. However, this right-wing hatchet job is an opportunity to clarify ideas for a new generation of socialist activists and workers taking action. We should fight for everything we can win under capitalism while building the struggles, education, organization and solidarity of working-class people to end this rotten system. Reforming capitalism won’t be enough, and we need to bring about fundamental change to stop the danger of right-wing reaction and planetary degradation due to climate catastrophe. Socialism isn’t about politicians owning companies as the White House paper would want you to believe. Genuine socialism means democratic control over the big corporations and our lives. A global economic plan would lay the basis to transition toward a green economy and lift billions out of poverty. In our struggle to end inequality, Marxists take up the fight against all forms of oppression including racism, sexism, and homophobia that are inherent in this system of exploitation. This struggle is not just in the U.S. Socialism is as international as the working class itself, and we will need to link up our actions across borders, as Google workers did last week. That’s why Socialist Alternative is in political solidarity with the Committee for a Workers’ International, organizing on every continent to end exploitation and oppression. Join us in our struggle to change the world!